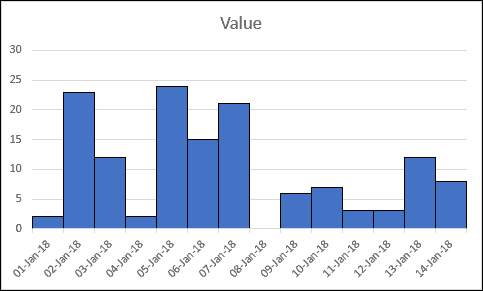 Excel column charts have gaps between their bars by default. Not everyone likes this default appearance, but fortunately it is possible to change the size of the gaps between bars and even remove them altogether. Right-click on one of the bars in your chart and click Format Data Series from the shortcut menu. The Format Data Series task pane appears on the right-hand side of the screen, offering many different options. Our Essential Skills course goes into great depth about formatting charts, but for the moment the Gap Width setting is the one you are interested in. 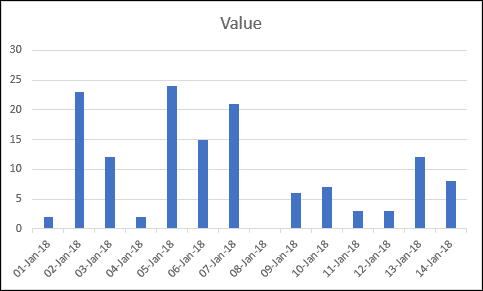 If this isn’t working quite the same way for you, it’s probably because this example uses Excel 2016 for Windows and you may be using a different version of Excel. You should be able to figure out the differences, but we also offer courses specifically for Excel 2016 for Mac, Excel 2013, Excel 2010 and Excel 2007. 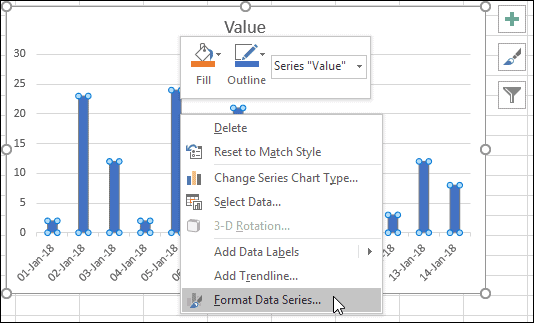 You should see a Gap Width setting on the Format Data Series task pane. You can use this slider to change the gap widths to your liking. Your chart should change immediately! Our Essential Skills course contains much, much more about chart formatting. I’d highly recommend it if you want to improve your Excel skills.